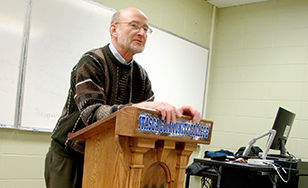 Robert Hartl teaches a class at Itasca Community College in this file photo. St. Scholastica plans to offer an MBA program in Hibbing, and will hold an information session from 5:30 to 6:30 p.m. Wednesday, June 10, in Room C-206 at Hibbing Community College. Providing a minimum cohort of 25 students is reached, classes will begin in early November. Classes will be conducted one night a week and students will achieve the MBA in 2 ½ years. "Our MBA students learn how to lead change," said Breanne Tepler, admissions counselor. "St. Scholastica has nearly 30 years of experience training our graduate business students to lead people in situations of transition and opportunity, which is very relevant for the Iron Range." Students with a bachelor's degree in any field are eligible, and no GRE or GMAT tests are required. The information session will provide facts about financial aid, as well as employer tuition reimbursement options. The information session will be led by Robert Hartl, associate professor of management. Tepler will also be present; for more information contact her at (218) 723-6792 or btepler@css.edu. "There's so much uncertainty happening in our region's employment scene," Tepler said. "Having this MBA in your portfolio makes you more marketable, and that's the best professional investment you can make in yourself."